Home Comparisons Samsung Galaxy M20 vs Galaxy M10: what’s different? Samsung Galaxy M20 vs Galaxy M10: what’s different? After a ton of rumours and speculations regarding its M series of smartphones, Samsung has finally gone ahead and launched the Galaxy M10 (review) and Galaxy M20 (review) in India. The devices were attracting a lot of attention even before their launch as they are the first from the company to come with the Infinity-V display, not to mention that the online-exclusive range is speculated to replace the erstwhile Galaxy J and On series of budget phones in India. So if the budget was not a constraint, which one of the two new M series smartphones should you pick? To solve this dilemma, here’s a detailed comparison between Samsung’s Galaxy M10 and Galaxy M20. As the name suggests, the Galaxy M20 is a more powerful variant of the affordable Galaxy M10. Let’s start with the highlight: the Infinity-V display that makes it debut in brand’s lineup through these phones. The Galaxy M10 comes with a 6.22-inch screen featuring HD+ resolution and 19.5:9 aspect ratio. On the other hand, not only the Galaxy M20 features a slightly bigger 6.3-inch panel but also comes with a sharper full HD+ resolution. The two smartphones are also poles apart in the performance department. The Galaxy M10 is equipped with a less powerful Exynos 7870 processor backed by either 2GB or 3GB of RAM with 16GB and 32GB storage. In contrast, the M20 gets a 14nm Exynos 7904 chipset with two RAM and storage configurations — 3GB + 32GB and 4GB + 64GB. In the imaging department, the Galaxy M10 offers a 5-megapixel shooter that sits in the waterdrop notch. In comparison, the Galaxy M20 offers an improved 8-megapixel lens in the notch with selfie focus. A major difference between the two is that while the Galaxy M20 comes with an oblong-shaped fingerprint scanner on the back, Galaxy M10 gets only the face unlock functionality. The differences between the two continues in the battery department as well since M10 and M20 come with 3,400mAh and 5,000mAh cells, respectively. Needless to say, the Galaxy M20 is a powerhouse when it comes to battery life. Samsung Galaxy M20 vs Galaxy M10: what’s the same? Now that we have skimmed through the difference in two M-series offerings, there are some underlying similarities as well. The first and most obvious common point the brand new Samsung Experience UI 9.5 based on the Android 8.1 Oreo. The M10 and M20 also come with the similar camera setup on the back featuring 13-megapixel f/1.9 primary sensor backed by a secondary 5-megapixel f/2.2 ultra-wide angle shooter. The onboard storage on both M series smartphones can be expanded up to 512GB using a microSD card. Samsung is also offering both smartphones in identical hues of Ocean Blue and Charcoal Black. By now it’s evident that with a starting price point of Rs 7,990, the Samsung Galaxy M10 cuts a lot of corners in comparison with Galaxy M20 that starts at Rs 10,990. If you want a powerful battery, better selfie camera and sharper display, the M20 is clearly a better pick, but if you can’t stretch your budget, then the Galaxy M10 is the one to go for. These smartphones go on sale in India starting February 5th exclusively on Amazon India. 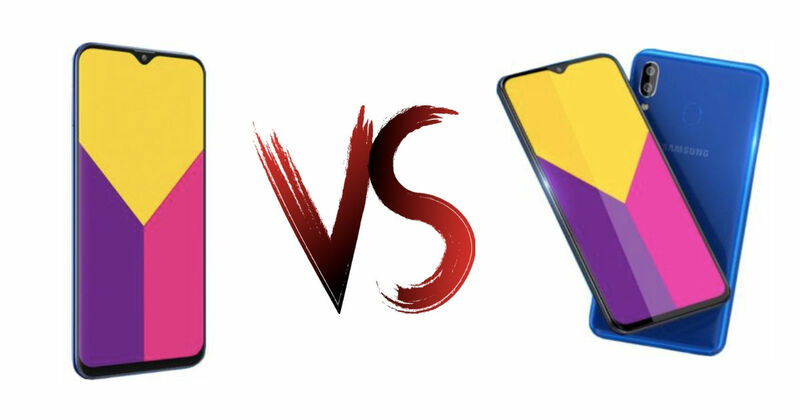 Next articleSamsung Galaxy M20 vs Redmi Note 6 Pro: can the Korean giant topple Xiaomi in the mid-budget segment?